They got him! The Secret Service released a statement on Thursday announcing that Beverly, Mass. resident Daniel Frisiello has been arrested for reportedly sending letters containing "white powder" to Donald Trump Jr. and four others in February. 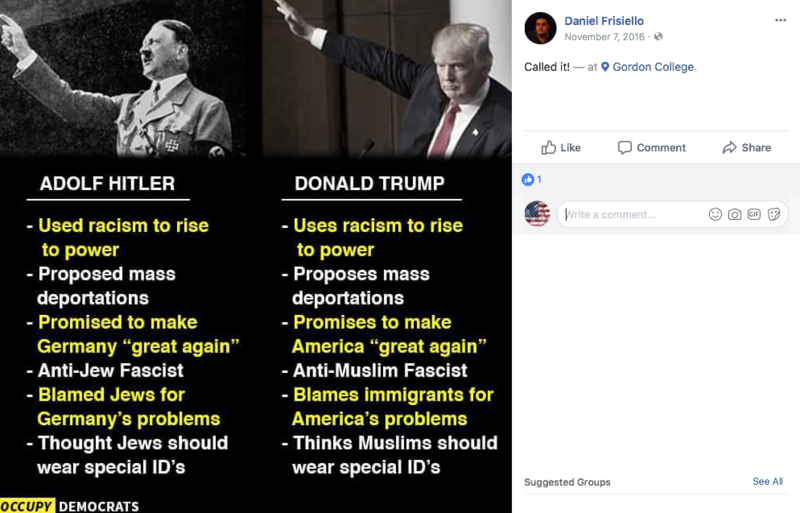 Judging by Frisiello's Facebook page, he's not the biggest fan of Republicans and the Trump family in general. The statement also included what Frisiello wrote to Trump Jr. in the letter that came with the "white powder." "You are an awful, awful person, I am surprised that your father lets you speak on TV," Frisiello wrote. "You make the family idiot, Eric, look smart. This is the reason why people hate you, so you are getting what you deserve. So shut the **** UP!" It's also being reported that Frisiello is cooperating with the FBI on this investigation. The DOJ statement also noted the four other people that received letters from Frisiello that also contained an "unknown suspicious white powder." The second envelope was addressed to Nicola T. Hanna, the Interim United States Attorney for the Central District of California. Also postmarked in Boston on Feb. 7, 2018, the envelope contained an unknown suspicious white powder, which spilled out when it was opened. It's still unclear what the mysterious "white powder" actually was. It was Trump Jr.'s wife, Vanessa, who opened the letter and discovered the substance inside the envelope. Vanessa Trump was transported to a New York hospital as a precaution, but the substance was later deemed "non-hazardous."